Dr. Biehle’s classic MCAT Physics Book presents a clear, insightful, and comprehensive analysis of MCAT physics. While other MCAT books merely list every obscure scientific concept that may be on the MCAT and expect you to memorize each one, Dr. Biehle’s book takes a conceptual approach to MCAT physics, challenging you to learn concepts instead of simply memorizing facts. Set up in an easy-to-follow format, even students who struggle with physics will be able to follow, understand, and master the logical explanation of each key concept. Plus, you won’t be bored to death by dry, text-book writing; Dr. Biehle’s lively prose and subtle wit make this challenging topic more palatable. Try it out, and we think you’ll agree — Dr. Biehle’s book is the best MCAT physics book available. Dr. Biehle received his Ph.D. from the California Institute of Technology (Caltech) in physics. He has ten years of experience at various levels in science education. The MCAT Physics Book is a result of his experience presenting physics concepts in a classroom setting to students preparing for the MCAT. The MCAT Biology Book provides a comprehensive review of MCAT biology as well as a thorough analysis of the MCAT Verbal section. In twenty chapters, learn the core concepts of MCAT biology through logically outlined, straight-forward text. Illustrations help emphasize relevant topics and clarify difficult concepts. Each chapter concludes with a set of problems modeled after the MCAT exam, with complete, detailed explanation of the answers. 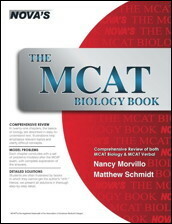 While other MCAT biology books merely cover every obscure fact that may appear on the MCAT biology section, this book challenges you to understand and master key biology concepts as opposed to mere rote memorization of facts. Authors Nancy Morvillo and Matthew Schmidt both obtained their Ph.D’s in genetics from the State University of New York at Stony Brook. The MCAT Chemistry Book presents a comprehensive review of MCAT general chemistry (“gen chem”) and organic chemistry (“o chem”) in an easy-to-follow, logical format. Each branch of chemistry is covered extensively, including illustrations and tables when necessary to help students understand the more difficult MCAT chemistry concepts. At the conclusion of each chapter, challenging practice problems with detailed explanations to answers test and further your comprehension. Even students who struggle with basic chemistry can master MCAT chemistry with the assistance of this comprehensive review book! 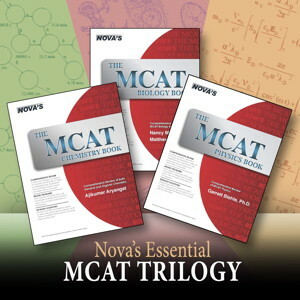 With this and its two companion volumes, The MCAT Physics Book and The MCAT Biology Book, Nova Press provides the most comprehensive series of test-prep books for the MCAT.